It was an awesome experience teaming up with the KAABOO Family for the get down up the coast in Del Mar, California. I exhibited original works and did a “LIVE” KREASHUN mural with J Feather. Solo works were also exhibited with Sparks Gallery at their booth. All Original paintings and the Kreashun mural were located in the “KAABOO Gallery” which you can visit in this link: https://www.kaaboodelmar.com/the-experience/artwork/ . The mural is now available for purchase through the “original works available” link. Thanks so much for everyone who came out and to the KAABOO TEAM for an amazing experience. 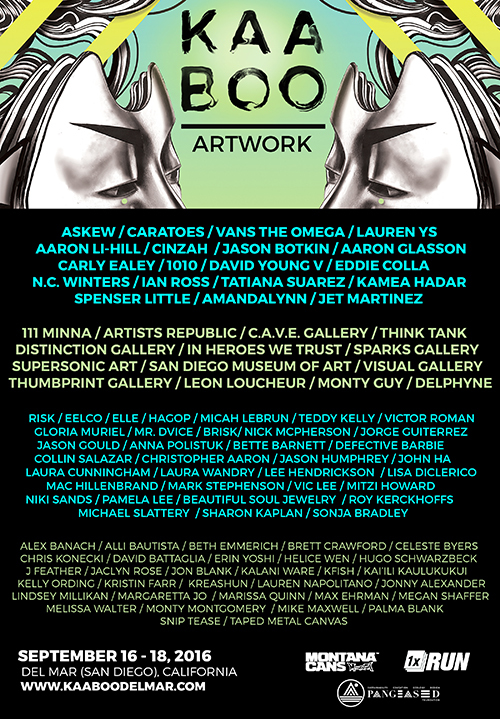 “We are thrilled to announce our second annual KAABOO Artwork Experience, taking place this September 16 – 18 at @kaaboodelmar We’ve got some amazing things lined up, including live mural painting, inspiring visual installations, and unique exhibitions by dozens of globally acclaimed artists!